Riding the train, one's body participates in a choreography of movements instigated by the twists and turns of the tracks. Largely ignored, this jostling constitutes a communal everyday kinaesthetic experience. However, we share this experience with more than our fellow travelers–this choreography includes non-human actors as well. kinaesthetic double-double is a "performing object" - in this case, a discarded coffee cup that replays the quotidian jostling brought about by the twists, turns, stops and starts of the subway. Before the exhibition, the artist will record the forces exerted on one’s body for a specific subway journey (e.g. 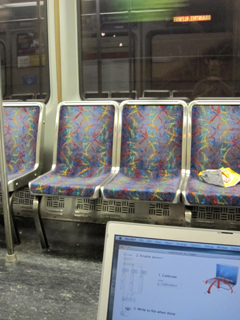 from Porter Square to Park Street station on the Red Line) by logging data with an accelerometer. These movements will then be “played back” by a motor mounted inside of a coffee cup (and driven by custom electronics) causing it to wobble to and fro as if it were reliving the journey. kinaesthetic double double is installed in the gallery, endlessly replaying the choreography of a discarded coffee cup riding on the floor of the T. The motor inside the cup moves a weight in order to 'replay' the forces recorded by a sensor on a ride from Porter Square to Park Street on the Red Line. The ride takes about 13 minutes. The cup then 'waits' 7 minutes - approximately the amount of time in between trains - and then plays the trip from Park Street back to Porter Square. It then waits again, and repeats the round trip ad infinitum. 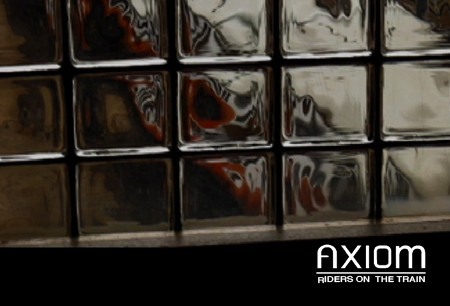 The piece was conceived for the exhibition RIDERS ON THE TRAIN curated by Nance Davies. The exhibition runs from November 10 - December 19, 2009 @ AXIOM Center for New and Experimental Media : Green Street T Station on Orange Line : Jamaica Plain, MASS. Video documentation from the exhibition at Axiom. This documentation was also viewed as part of the Project Mind the Gap panel at ISEA 2011 in Istanbul. See other videos from the Riders on the Train exhibition and the Project Mind the Gap panel. To the left, is the recording session, using a Max/MSP external that accesses the readings from the Macbook's internal accelerometer. The external is written by Masayuki Akamatsuand is part of his excellent aka objects. Below is a visualization of two axes of movement of the ride from Porter Square to Park Street.